Buffalo Chicken Wing Dip is an easy and addictive finger food that tastes great any time of the year. This Buffalo Chicken Recipe is perfect for tailgating, bridal and baby showers, church functions, book club nights and any occasion where there is food! 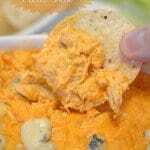 Buffalo Chicken Wing Dip is a fast and easy Buffalo Chicken Recipe. This Buffalo Chicken Recipe is standard fare at my friend’s house, for entertaining and after you have one taste, I think you’re going to understand the reason for this. 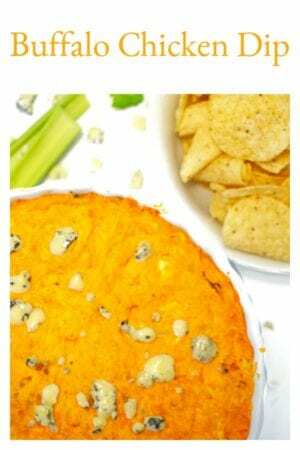 Our Buffalo dip can be made, start to finish, in 45 minutes or less and goes great with tortilla chips, celery, carrots, crackers, or just a fork! Remember, we don’t judge! Garnish this Buffalo Chicken Wing Dip with bits of savory blue cheese or small dollops of ranch dressing. It’s fast. With only a few ingredients, it goes in the oven and is ready in just 30 minutes. It reheats well for leftovers. We took some to a church from what was leftover on Saturday. It’s loved by kids and adults, alike. I’ll be honest with you, the first few times I was at Amy’s house, and this was in my presence, I avoided it like the plague. Why you are likely asking? 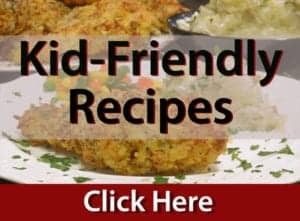 Judging from the reaction to other guests and her kids, I had a feeling this recipe would be dangerously delicious. A few visits later and I completely caved and gave it a try; I was spot on. Make this Buffalo Chicken Recipe for any social event that involves food! You can skip the blue cheese crumbles if you’re not a fan. I’m a lover of all things cheese, I guess that’s what happens when you grow up with a dad who had a passion for such things as Limburger. Maybe it was the cheese sandwiches and mayo that my mom made for me as a kid. The most likely reason though, it’s just who I am. If you prefer ranch dressing with your wings, try substituting that for the blue cheese dressing. Keep in mind that our kids generally won’t go near blue cheese, but this Buffalo chicken dip is an exception. Give this Buffalo chicken recipe a try and then share it with friends. 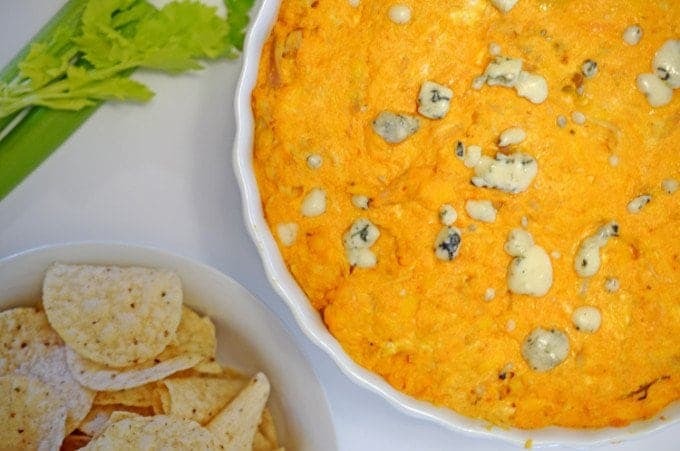 You’ll lose count of the number of times someone asks you for this Buffalo dip recipe. 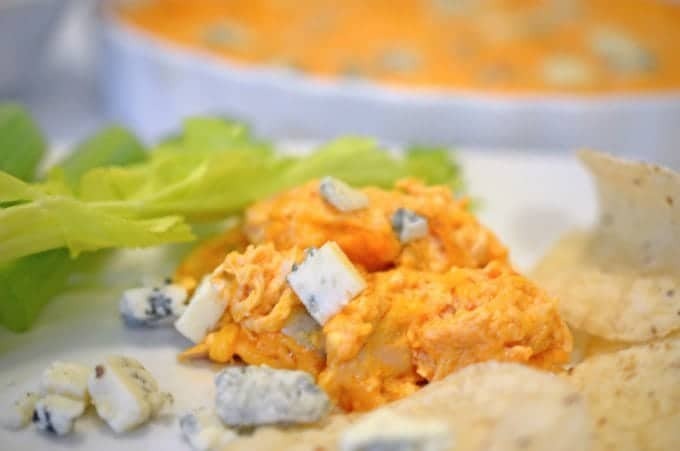 Make this Buffalo Chicken Wing Dip for your next tailgate party or get-together! 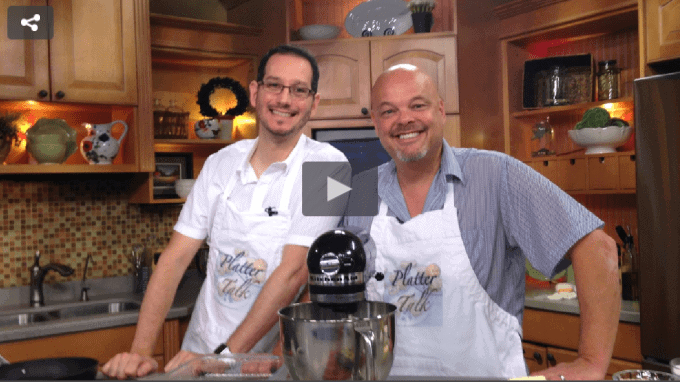 Watch The Platter Talk Guys prepare this Buffalo Chicken Wing Dip, on Good Day Wisconsin. Make this easy recipe for Buffalo Chicken at your next party. 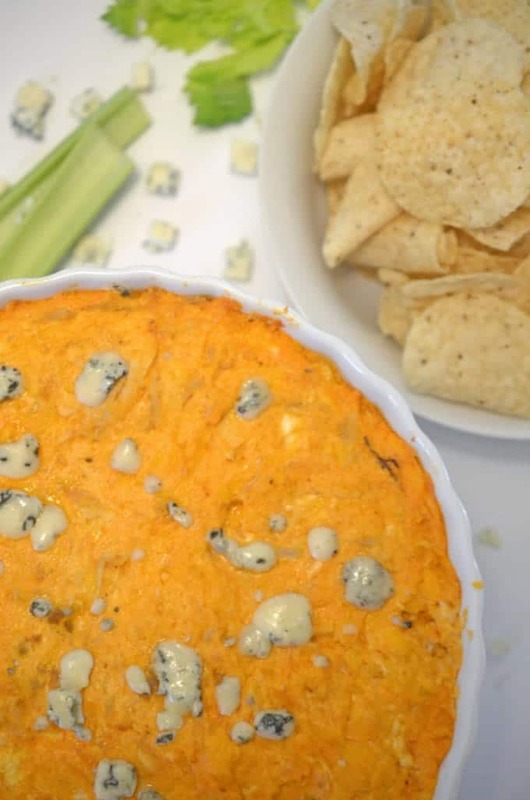 It's an addictive Buffalo dip that even the kids will love! 1/2 cup blue cheese dressing. In large mixing bowl, combine all ingredients and stir thoroughly. Spray oven safe dish with non-stick coating and transfer mixture. 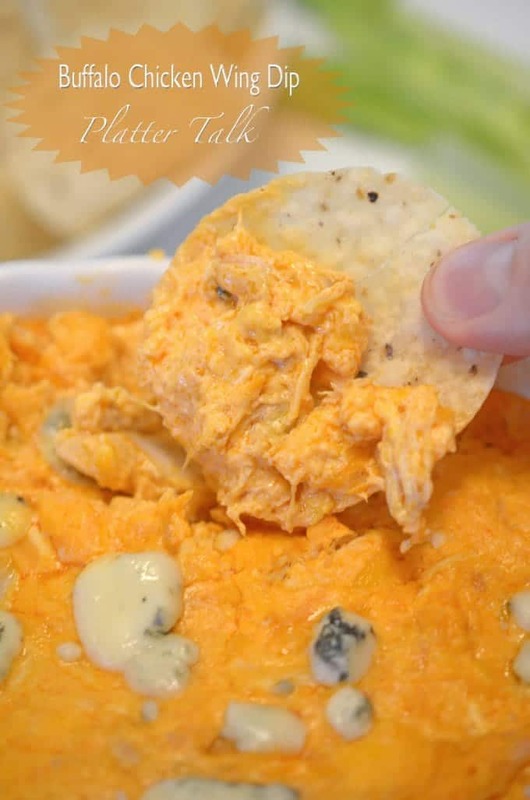 Pin this Buffalo Chicken Wing Dip for Later! Buffalo chicken wings are made weekly at my house. Thanks for the new dip recipe, this is a game changer. My family are huge hot wing fans! This sip looks amazing. I’m going to surprise my boys with this dip this weekend. I can understand why you would avoid it — keep away from temptation. I doubt if you can take just one bite. This would be a great recipe for a gathering — I know our family would be nuts about it. I’ll be making this VERY soon. This is a crazy good recipe. I can imagine this amazing dip would be dangerously addictive. Who can say no to buffalo wings and more so who can say no to dangerously delicious buffalo wing dip! 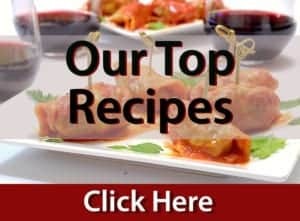 This recipe makes me crazy! It really impresses me. Great idea for a party. Very interesting combination of all ingredients. Great for me and my family. Of course I want to try it. Looks incredibly tasty. THANK YOU! What a fabulous buffalo chicken wing dip! A perfect appetizer for the holiday season. Wow, what a flavorful and delicious dip that is. Anything buffalo flavored and blue cheese has my name written on it. It looks amazing. No kidding…this stuff in every single shape and form that I’ve ever had it in, is dangerously addicting! I also avoided it for the longest time haha! Versions of this dip are always a hit in my neighborhood. People bring it to potlucks like our grandmas brought jello salads! I like your addition of the Bleu cheese sprinkled on top. Dangerously delicious is accurate! Anything buffalo wing flavored is high up on my list of addictions. Add the blue cheese flavor with it and I’m hooked. I’m about ready to become addicted to this dip! I’ve been meaning to try out a buffalo chicken dip for so long! Yours looks SO delicious! I’m usually a ranch girl too, but you’ve sold me on this one, guys! can’t wait to try this one! Okay, my eyelids are blinking rapidly. Why? Because this recipe is dangerous. Truly dangerous. I’m devising ways to make it now and eat it for dinner. My biggest question is, will my husband go for it? Thanks for sharing. I love buffalo dip but have never put the blue cheese crumbles or dressing with it. Genius! Wow! this buffalo chicken wing dip is perfect, easy and quick to make with flavors everyone ‘gobble’ up. This dip sounds really delicious! I love all that cheese! Bet this is addictive! I think I could get hooked on this one Dan! Yikes it sounds delicious. This one is pretty difficult to say “no” to! This looks over-the-top delicious Dan! Buffalo chicken dip is one of my favorites! I have a recipe I make all the time for parties. But I will gladly try another. I have yet to meet a wing dip recipe that I don’t like! Michelle, like anywhere else, it’s always good to know who and where your friends are; buffalo chicken wing dip is one of those friends you can count on, anytime and anywhere. Thanks so much for stopping by.